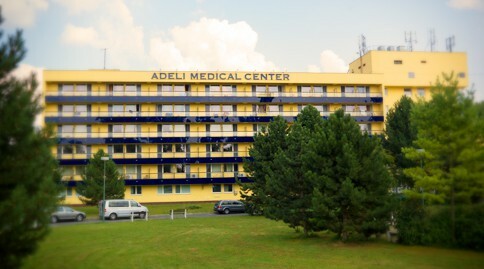 The ADELI Medical Center is one of the leading institutes in Europe specialising in neurorehabilitation. The institute is licensed and active in the following fields of medicine: neurology, medical rehabilitation, physiotherapy, rheumatology, balneology, clinical speech therapy and intensive medicine. With more than 15 years of experience and more than 260 qualified employees, ADELI provides its unique treatment mainly for people suffering from damage to their central nervous system (such as cerebral palsy, stroke, and traumatic brain injury). These conditions are usually caused by birth trauma, brain haemorrhage, cerebrovascular accident or intracranial injury. What makes ADELI special is the high intensity and individuality of the neurorehabilitation. A patient is accompanied through his or her daily treatment programme by five or six specialists, for 4 to 6 hours a day, 6 days a week. With approximately 30 hours of therapy per week, ADELI Medical Center is the European leader in the intensity of the treatment. ADELI therapy is based on rare and highly specialised treatments, some of which originate in space or underwater neurology and intensive medicine. Good examples are dynamic proprioceptive stimulation with application of devices from space medicine or oxygen therapy in a highly modern hyperbaric chamber and many other concepts with their respective combinations. Sign up for our newsletter and get the latest information and news from ADELI Medical Center.